This award was presented for the first time at the BMDCV Speciality in 2010. Cloudforest Jaeger - Kai has been awarded the "Shining Knight Award" for his many, many achievements. Kai and his best friend Sue Murray, have accomplished many things. 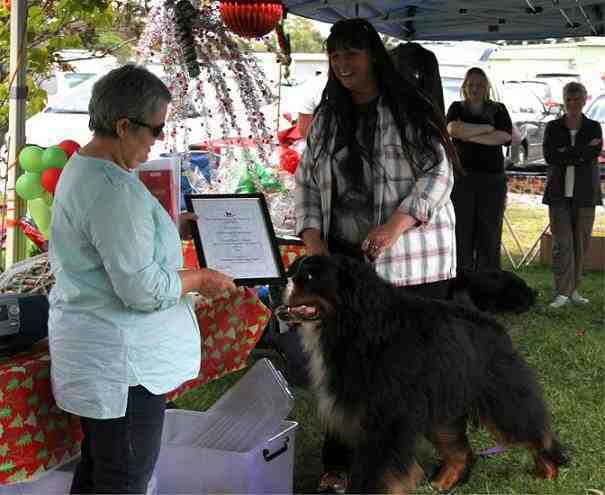 The list includes an array of titles, as fund raisers for the Bernese Mountain Dog Club of Victoria's rescue group - Guardian Angels, helpers and participants at club events and as an amazing ambassador for his fellow Bernese Mountain Dogs. Kai and Sue together have worked to gain many titles. Sue and Kai are also members of The Westernport Obedience Club. Sue has raised over $4000 selling her beautiful, handmade blankets over the last eighteen months. A tremendous effort to help the club's Guardian Angels Fund. Everyone knows Kai! He goes to most club walks, he helps at the sausage sizzles and SueKai help Julie with club events such as the Pet Expo. I remember at the Caulfield Pet Expo Kai pulling a cart around with a small passenger. He has won the Christmas dress up competition year after year until this year. Sue helps him with his costume as one thing he can't do is use a sewing machine. Sue is so creative! Sue is also an accomplished photographer capturing our Berners and their families at club events. You can see her work on Sue's Facebook page called BERNER TRAGICS. "The Shining Knight Award" for 2013. P.S. The Shining Knight Award is donated by Annie Bell each year in memory of her heart dog, Zanzebern Shining Knight - Harry Brat. 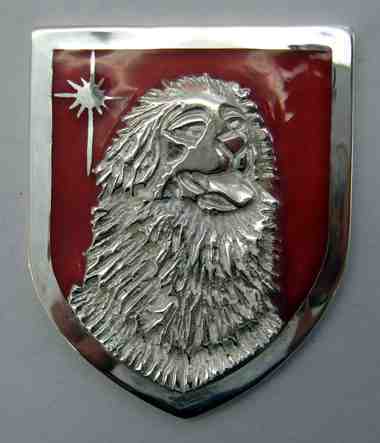 The small shield is crafted in silver with an inlay of red enamel. A silver model of Annie's Harry Brat is set into the enamel. The piece is valued at over $1100. This award is presented to a Bernese Mountain Dog who has achieved greatness through service to others. The Club would like to thank Annie Bell for this most generous contribution to the Club. Annie has been awarded an Honorary Membership for 2013-2014 for her many contributions to the Club. . The Harry Brat Shining Knight Award was presented at the BMDCV Speciality in 2010 for the first time.